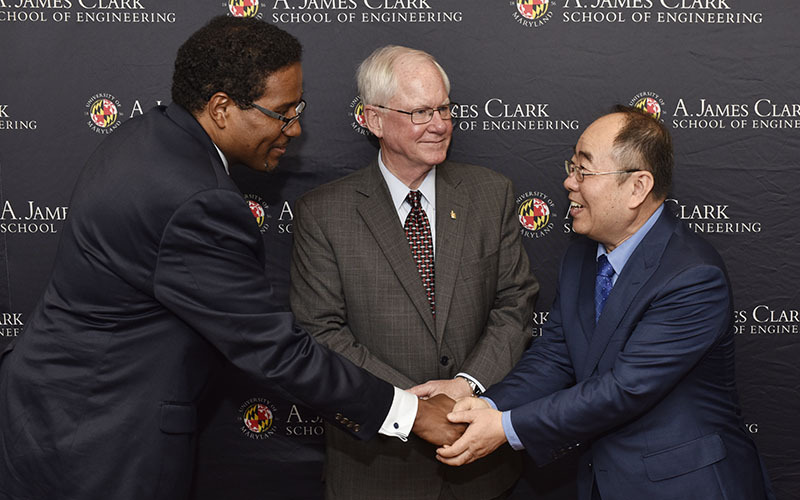 The Department of Civil and Environmental Engineering (CEE) at the University of Maryland (UMD) last week announced a gift of $500,000 from Glodon Software, a Beijing-based company specializing in the development of construction engineering and project management software. The majority of the gift will establish the Glodon Software Research Fellowship and support improvements in the CEE curriculum in the areas of smart construction, energy efficiency, and sustainable materials and practices. “Glodon Software’s generous gift will allow us to provide graduate and undergraduate students alike with more hands-on learning opportunities incorporating the latest construction technologies, which is crucial to ensuring our graduates are prepared to meet industry needs,” said CEE Chair and Professor Charles Schwartz. The gift also provides $150,000 to enable Associate Professor Qingbin Cui and his research group to expand their research into smart construction practices, including developing tools for big data-based construction innovation, analyzing building energy efficiency within smart cities and counties, and establishing a framework for integrating smart sensors with structural health monitoring technologies. At least two outstanding Ph.D. candidates, research assistants, post-doctoral researchers, or research scientists working with Cui will be awarded the Glodon Software Research Fellowship. Selected fellows will receive funding for a minimum of a year. "The construction industry is in a period of transition to a more digitized state. Sustainability, industrialization, and digitization will inevitably become the future trend," said Glodon Software Chairman Zhizhong Diao. "We are looking forward to working with the Clark School to lead the construction industry into the new era." The gift, which was announced on October 15 with a signing ceremony on the UMD College Park campus, also establishes Glodon Software as a member of the A. James Clark School of Engineering’s Corporate Partners Program. As a corporate partner, Glodon Software will support recruitment and internship opportunities, scholarships, and student activities. A member of CEE’s Project Management Center for Excellence, Cui’s research sits at the leading edge of sustainable construction practices and effective project management. He has worked with the Federal Highway Administration, the state of Alabama, San Francisco County Transportation Authority, and others to encourage private investment while safeguarding public interest. His research has also helped the construction industry reduce carbon emissions while managing the risks and complexity of using new methods and materials.